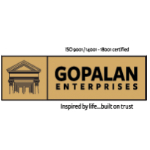 Gopalan Enterprises bears the stamp of innovative design and superlative quality construction. The Group’s commitment to quality construction, modernity in architectural value, space management, and customer satisfaction has set up new trend among property developers in Bangalore and India. The Group has emerged as one of the competitors for promotion of Special Economic Zone, generating exports and employment. The group enjoys giant presence in the Knowledge City with and boasts of a prestigious global clientele.